Okay, so I hope I didn’t keep you in suspense all weekend! Here are the last 5 tips to achieving your fat loss goals. For those of you who have been successful fat losers, please add comments at the end. The more tips from those who know what works, the better! #6: Practice the 80:20 rule. You can’t expect to be perfect for the rest of your life and setting super impossible high expectations will definitely set you up for failure and feelings of inadequacy. Instead of saying, ‘I’m never going to eat chocolate again’, decide that you’ll eat it only once per week. Instead of determining that you’re going to eat perfectly 7 days a week, decide that you’ll eat really healthy 5 days a week and then 2 days, you’ll allow for a few indulgences. This is much more realistic and is something that you can adhere to for the rest of your life. We have to stop thinking “All or Nothing”. This just leads to failure and then the resultant binges. Remember that if you want to be 10 pounds lighter 10 years from now, then it’s not what you do over the next 6 weeks, but rather what you do for the next 10 years! So ask yourself, what type of a nutrition plan can you follow forever? #7: Limit your alcohol intake: Alcohol poses a number of problems. It is high in calories and lacking nutrient value. Some researchers have also suggested that because alcohol is metabolized in the body first, any food consumed in combination with the alcohol will be more easily converted to fat. And finally, and probably most importantly, alcohol reduces your inhibitions. You may be more inclined to indulge or make poor choices because you aren’t able to think clearly or examine the long term consequences. Most people won’t commit to never drinking again, but instead of drinking every night with dinner, limit it to 1-2x/week. #8: Increase your daily activity: Try to think of ways that you can be more active throughout your day without having to actually exercise. The calories expended from walking a few extra blocks, taking the stairs, or performing errands in an active fashion really add up! If we could learn to just be more active throughout the day, we wouldn’t have to spend hours in the gym! #9: Try not to eat large amounts of food past 8:00pm. Eating late at night often goes hand-in-hand with high-fat snacks and overeating. Secondly, it never feels good to go to bed on a full stomach! #10: Keep an activity and food log. Record your daily exercise and what and how much you eat. Some researchers have found that just the act of recording the foods you eat, result in better choices and a healthier diet. Also by writing everything out, you may also start to notice patterns. For example, you may observe that the days you don’t exercise are also the days you eat poorly. You can then take appropriate action. It’s also a good idea to set daily goals to break the long-term ultimate goal into smaller chunks and to keep your goals in the forefront of your thoughts. Be sure that your goals are behavioral in nature (ie. drink 8 glasses of water, exercise for 30 minutes, eat 5 small meals) instead of body-focused (ie. I will lose 1 pound this week, I will drop 10 inches by Monday etc.). Last final words of wisdom are to be patient. Safe fat loss often takes months and sometimes years – definitely not weeks or days! Be persistent and consistent! Finally, accept your genetics. If you come from a pear-shaped family, you most likely will always be a pear-shape. But you do have the choice of being an in-shape or an out-of-shape pear-shape! Don’t compare yourself to other women or men, instead, try to implement these changes because they are healthy changes and you deserve to take care of yourself! We know from experience that if being thin is your goal to make you happy, you’re never going to be thin enough to be happy! So learn to be happy in the body you’re in right now! As a Personal Trainer, the number one request I get from clients is fat loss. Since I received a lot of emails after my last post on high intensity versus low intensity exercise and how that translates to fat loss, I’m going to stay on this topic and cover the Top 10 things you can do to lose fat – safely, effectively and permanently. You’ll only get tips from me that will provide lasting, long-term results. I’ll cover the first five today and the last five on Monday. It’s interesting to note that these days the general public is more health-conscious and the availability of low and no-fat products has increased dramatically and yet, our population continues to get fatter. In fact, the average adult weighs 8 pounds more than just a decade ago! So why do we continue to gain weight? Some researchers have estimated that our population expends 500-800kcal less per day compared to a few decades ago because of labor-saving devices like escalators, elevators, remote controls, computers, and urban transportation. We don’t even have to leave the house for fast-food! If we do go out for dinner, Valet Parking cuts out the few blocks of walking to our vehicle. We’ve got to face it – laziness rules! Case in point – analyze this photo closely. We also live in a society where food is in abundance. Portion sizes tend to be huge and processed foods fill our cupboards and fridges. Some researches have suggested we consume 100-300kcal more per day than a few decades ago. Expending less energy, consuming more food and a society where exercisers are a minority results in a society that is getting fatter! So what can you do about it? You’ve got 4 choices: diet, exercise, both or liposuction. The first option will definitely result in failure. Ninety-eight percent of people who go on diets gain the weight back. It appears that losing the weight in the first place, is not the hard part. In fact, people successfully lose weight all the time. It’s keeping the weight off that’s the hard part. The problem is that when you diet you lose valuable, energy-burning muscle tissue which drops your metabolism making it easier to put the weight back on. And secondly diets are, by nature, a short-term phenomenon. You often feel deprived during the diet-stage and thus, once you’ve lost the desired weight you return to old habits and patterns and the weight is quickly regained. The second option to lose fat is exercise. This is a good choice but unfortunately, for many people, exercise by itself is a painfully, slow process. A fat-loss exercise program may exhibit a 2% change in body-fat over a 12-18 week period which would translate into 3 pounds of lost fat. That’s equates to about a pound lost per month. When people are looking for immediate results, they often don’t have the patience to wait! 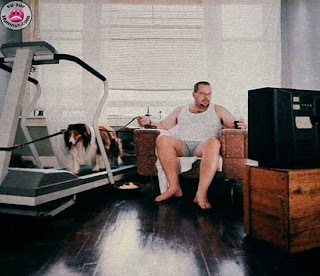 The third option is to exercise and diet simultaneously. Research has found this method to be most successful at reducing body fat and, most importantly, helping to keep it off. The final option, surgery/liposuction, is a costly choice. Furthermore, if the diet and exercise habits of the individual are not altered, the individual will eventually get fat again. Even though they may have less fat cells, the fat cells they still have can get bigger! #1. Aerobic Exercise: The American College of Sports Medicine recommends aerobic exercise 5-7 days/week for 20-60 minutes each session to maximize fat loss. If you’re just starting with exercise you may want to take a couple months to progress slowly into this 5-7 days/week range. Aerobic activities like walking, running, cycling, swimming, fitness classes, hiking, cross-country skiing, stairclimbing and rowing will do the trick. These activities expend a lot of energy and will burn up a lot of fat and thus, should be a focus of your exercise program. The intensity of your aerobic workouts should be within a 5-8/10 on the rating of perceived exertion scale. This means you should be able to work up a sweat, feel your heart pumping and be breathing more rapidly. We also encourage you to split your weekly aerobic workouts into easy, moderate and hard days to vary the intensity and train all energy systems. High intensity interval training will definitely get you in great shape fast allowing you to burn more calories overall during each workout translating into faster fat loss. #2: Resistance Exercise: Regular strength training workouts are also critical to maximize fat loss. Muscle is an energy-burning tissue and therefore, if you have more of it, your metabolism revs at a higher rate making it easier to burn fat both during and after exercise. You don’t need to spend a lot of time in the weight room. Pick exercises for all the large, major muscle groups and perform just one set of 8-15 reps. You should be able to get in and out of the weight room in 30-40 minutes two to three times per week. These short muscle-conditioning workouts are sufficient to achieve the results you’re looking for and are the best way to actually sculpt your body. #3: Eat 5 small meals and snacks each day. Studies indicate that when people eat more regularly throughout the day, they are less likely to overeat or indulge in less-healthy choices. Food at regular intervals also maintains a more balanced blood sugar level which keeps your energy levels higher throughout the day. Try to consume smaller meals or snacks every 2-3 hours during the day. Be sure to include protein and high-fiber foods at each meal/snack to help keep you full longer. #4: Drink 8 glasses of water every day. Our body is 50-60% water and when we are dehydrated, our body and it’s organs and systems don’t function at their optimal level. This limits your ability to exercise intensely and ultimately, will affect your ability to burn body fat. Many scientists also suggest that headaches, minor aches and pains, low energy, sleeping problems and injuries may be a result of dehydration! Eight glasses of water each day will replenish the fluids you lose throughout the day as a result of normal human respiration. #5: Focus on what you should be eating instead of what you shouldn’t be eating. Ensure you consume 5 vegetable and 3 fruit servings every day. Fruits and vegetables are high in nutrients and water-content and low in fat and calories. It’s much more difficult to overeat when your diet consists largely of fruits and vegetables. If you fill up on your fruits and veggies, you’re going to have less room for the high-fat, nutrient-poor foods. Stay tuned on Monday to receive the last five tips. What’s the best method for burning fat – long & slow or short & fast? A number of years ago, you may remember many fitness professionals prescribing lower intensity activity to maximize fat loss. Many fit people lowered the intensity of their workouts fearful that they were not burning fat. Unfortunately, they were misled and many people still believe that low intensity activity is the best way to maximize fat loss. In fact, I just heard a well-known doctor (mind you a psychologist not a physiologist) recommending that if people want to burn fat they need to slow down! So it caused me to want to include the following information in today’s blog. I hope it helps to clarify the issue for you. The reality is that the activity that expends the most amount of calories will lead to the most amount of fat burned. Yes, during lower intensity activity you will burn a higher percentage of fat and during higher intensity activity you will burn a higher percentage of carbohydrates or sugars. But the important point to note is that during low intensity activity you are burning fat at a higher percentage of a lower amount of calories. When you exercise at a lower intensity you are definitely expending less calories. The selective use of fat as a fuel, specifically at lower intensities, does not translate into greater fat loss, regardless of how tempting it is to draw this conclusion. The more important focus with regard to calories expended, is not the percentage of energy coming from fat, but rather the total volume of fat used and the total number of calories expended. Let’s look at the math. From these figures you can see how fitness leaders could have been misled. If you were to examine only the first line, the percentage of fat being burned as fuel, you would definitely prescribe lower intensity activity. However, if you examine the whole picture, it is clear that higher intensity activity definitely expends more calories and also more fat. Here are some more statistics to convince you. It takes approximately 3,500 calories to burn one pound of fat. Compare the following exercise programs. If you followed Program A, it would take you eight weeks to burn one pound of fat! Most people would give up by then. If you could easily handle the higher intensity of Program C, wouldn’t you prefer to just wait 2 weeks to burn off that pound of fat deposited around your waist, hips or thighs? Remember though, if you can’t handle the higher intensity of Program C, follow Program B which means you can maintain the easier intensity but you just have to go longer. Time is definitely an issue for a lot of exercisers and most don’t want to spend hours in the gym if they can get the same results in a shorter period of time. Consider this. At 60% of your max heart rate, it would take you approximately 40 minutes to burn off 300 kcal. If you could handle a higher intensity and were able to exercise at 80% of your max heart rate, it would only take you approximately 27 minutes to burn the same 300 kcal. If time is a factor and you do not have a lot of time to waste, would you rather exercise for 40 or 27 minutes and still burn the same amount of calories? If I have not convinced you yet, consider this. Did you know that the highest percentage of fat that you burn during any activity is during rest! At rest, you are using approximately 50% fat as your fuel – that is the highest % of fat you can burn – you are never burning 100% fat. That’s right, just sitting here reading this blog, you are burning the highest percentage of fat you could possibly burn. That is because your body can only store a limited supply of carbohydrates (sugars) and so during rest, the demand on your body is low and your body wants to spare your precious sugar stores. Since you have an unlimited supply of fat stores, your body would rather burn fat during rest. But remember that although you are burning a higher percentage of fat at rest, you are expending very few calories (approximately 1kcal/min) so overall you are not burning a lot of fat. If type of fuel utilized was the critical factor for fat loss, then we would be prescribing more rest because this is when we burn the highest percentage of fat as fuel. But it is a higher percentage of a lower number of calories. So, of course, we know it is ridiculous to even consider rest or sleep as a high fat burning activity. One last note. Examine elite level athletes like sprinters. The majority of their training sessions involve high intensity, sugar-burning activity. But have you ever seen a fat sprinter? Of course not. Although, they are burning a lot of carbohydrates or sugars during their training sessions, they are also expending a lot of calories and a lot of fat. In fact, some sprinters eat over 5000-6000kcal/day without gaining any fat! • Most effective method for raising anaerobic threshold. Your anaerobic threshold is the stage of exercise where you feel very tired and feel the need to either stop or slow down. You may feel dizzy or nauseous if you stay at this level too long. By incorporating higher intensity activity into your exercise workouts, you raise your anaerobic threshold. This means that you can exercise at a higher intensity before you start to experience those uncomfortable sensations. • Most effective method for inducing training adaptations. Incorporating this type of training into your program will enable your body to handle the higher intensities more easily. You will find that intensities that used to leave you breathless and fatigued, no longer challenge you anymore. Soon, you will be able to expend more calories per minute compared to when you first started exercise. When people first initiate an exercise program, a comfortable calorie burning level is approximately 5cal/min. Elite athletes can expend more than 20cal/min and sustain it for over 2 hours! As a result, it takes them a lot less time to burn one pound of fat. • Most effective method for increasing fat mobilization. This means that as you get fitter, you actually get better at burning fat. Inside of your fat cells, you have enzymes called hormone sensitive lipase and lipoprotein lipase. Hormone sensitive lipase, the “good guys”, are responsible for releasing fat from a fall cell to be used for energy. Lipoprotein lipase, the “bad guys”, are responsible for the uptake of fat from the blood stream into fat cells to be stored. Lipoprotein lipase functions to develop our unwanted bulges. If you have lived a sedentary lifestyle and have eaten a poor diet all your life, you will have a lot of the “bad guys” and they will be very good at their job. You will have fewer “good guys” and they will not be so competent with their responsibilities. The goal is to get more good guys doing their job. But changing the internal chemistry inside of your fat cells may take years. So in the beginning you may not be experiencing results as quickly as you want because you body is actually working against you. But with consistency in your training program, your body will soon start to work for you. Soon you will have increased your ability to mobilize and use fat as a fuel. Training in a high intensity zone will make you fit quick and enable you to enjoy this wonderful training benefit. Soon you will be burning more fat during and after exercise. You will become a fat burning machine! • Experience a higher EPOC (excess post oxygen consumption). Have you ever wondered why you continue to breathe heavy and sweat after your workout is done? Why doesn’t your breathing and body temperature go back to normal immediately? After exercise you consume a greater amount of oxygen to assist your body in recovering from the stress of the workout and the demands it placed on your body. It is important to know that EPOC uses fat as its fuel. At higher intensities, your EPOC is greater translating into a greater caloric and fat expenditure post activity. Although the effects of EPOC are small, if you expended an additional 100 calories post exercise as a result of a high intensity exercise session, within 100 workouts (5 months), you would have burned an extra 10,000 calories or 3 pounds of fat! • Intervals are the best way to add intensity to a workout by adding brief, high-energy outputs followed by active recovery phases which will avoid fatigue and injury. So, the bottom line is that everyone can benefit from incorporating high intensity training into their program once they have completed about 2 months of initial level base conditioning. Please note however, that every workout should not be a high-intensity workout. Doing so could result in burn-out, over-training and injury. The recommended fitness prescription is one that includes all intensity training zones. That is, sometimes you go easy and long and other times you go hard and fast. This will ensure you train all of your energy systems and minimize overtraining. Reminder – Don’t start a new fitness program with high intensity exercise. Complete a couple months of easier, base conditioning first and then slowly start to add your intervals. 4 Stretches to do if you’re super tight! Stretching offers numerous health benefits, unfortunately, most people either don’t stretch correctly, long enough or skip it all together. The most neglected component of fitness is stretching and for those who are the most tight, stretching is usually such an uncomfortable experience that they avoid it all costs. After working in the fitness industry and training clients for over 20 years, I have a system that has even our most rigid, tight, “can’t touch their toes” clients, enjoying their stretching segments. 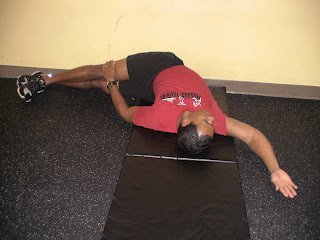 We’ve found that if we can make a stretch comfortable enough that a client doesn’t even realize they’re stretching, they will often hold it long enough to allow the muscles to lengthen. For this reason, we’ve found wall-stretches to be most successful at increasing the enjoyment of the stretching segment. While our clients are stretching, their back is in its neutral position which is very comfortable. They don’t have to use any of their muscles to support their back. They can instead just relax and focus into the stretch. They can also read or watch T.V. in this position which will increase the amount of time they hold any stretch for. Our clients find these stretching segments so enjoyable that they hold the stretches longer than they ever have before and are now stretching everyday. They would have never dreamed of stretching this much before! 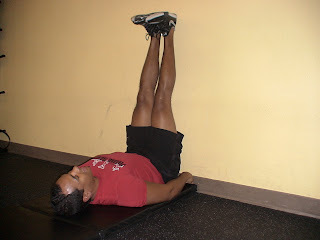 Hamstring: Lie on your back with your legs against the wall with your heels towards the ceiling. Find a position where you can feel a light stretch in the back of your thighs. To make the stretch more intense, move your buttocks closer to the wall. To make the stretch less intense, move your buttocks further from the wall. Hold this stretch for as long as you feel comfortable. Try to relax and breathe in to the stretch. Feel free to read a magazine or watch T.V. while holding this stretch. Hips and Back: Start with your legs in the hamstring stretch position. Now slowly let both legs fall to one side until they are resting comfortably on the floor (if you’re tight, it’s okay to have the legs suspended above the floor also). Try to feel this stretch through your hips and lightly through your back. Adductors: Start with your legs in the hamstring stretch position. Now slowly separate your legs into a V-position until you feel a light stretch through your groin area. Glutes: Move yourself back about one foot away from the wall. Position one leg so that the bottom of the foot is in contact with the wall and the knee is at 90 degrees. Cross the other leg over so that the ankle is resting on the thigh. To make the stretch less intense, move your buttocks further from the wall. To make the stretch more intense, move your buttocks closer to the wall or lightly press the crossed leg away. Remember to hold each stretch for at least 30 seconds. This is when the real stretching actually begins and also remember that light stretching is much better than deep, painful stretching! Staying consistent during the summer holidays. I’ve had so many clients tell me they’re having a really hard time with workout consistency now that the kids are home from school and they are out of their routine. I have written some previous posts to give you some ideas on how to make sure you still get your workouts in no matter what. Today, I wanted to show you a video clip of me going out for a run with the kids. You’ll have to excuse my amateur filming skills – it’s definitely not Jim Martin MVP Video Production quality. But hey, do you know how hard it is to film when you’re running?! Anyways, I hope you don’t get dizzy – maybe just listen and not watch. Click on the link above. Listen to some of the things that Brianna says. I’m confident that by involving your kids in your workouts, they’ll get something out of it too! Read more on Staying consistent during the summer holidays….